Our tour to Northumberland is based in the traditional market town of Alnwick. Dating back to 600AD, the town's history is evident from its ancient buildings and cobbled streets. From here we visit the magnificent Alnwick Castle and enjoy a full-day excursion to the magical Farne Islands, a bird watchers paradise! Our four-star hotel is wonderfully located above the River Tyne and facilities include a health club with indoor pool, sauna, steam and gym, a welcoming lounge bar and Windows on the Tyne restaurant, which offers stunning views of the Tyne Bridge. The modern, air-conditioned rooms are all en-suite and include TV, telephone, hairdryer, ironing equipment and tea / coffee making facilities. This hotel has a lift. Your holiday inclusions are listed below and one free day at leisure. Also included is a visit to Mainsgill Farm on either your outward or return journey. - Today we have included entrance to Alnwick Castle and its impressive gardens. 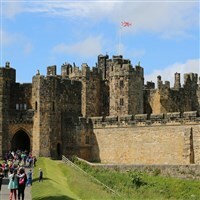 Seen on the big screen as Hogwarts in the Harry Potter films and as Brancaster Castle in Downton Abbey, the iconic Castle is one of Northumberland's biggest tourist attractions! Today we enjoy a boat tour around the Farne Islands, the most famous Sea Bird sanctuary in the British Isles! Explore the visitor's centre and marvel at the spectacular sights, including the medieval Pele tower, a Victorian lighthouse and (hopefully) an abundance of birds, seals and dolphins!